As a kid, I don’t know if there was anything more satisfying than waking up on a lazy Saturday morning to a heaping pile of French Toast. It may be almost as satisfying as dropping chain fungal growths on an entire Terran army — I wouldn’t know, I’ve never been on the side of the swarm. I wanted to make an alternative to the traditional French Toast… Something with a bit more personality and complex, yet deceivingly simple. Oh, and of course purple! No Zerg can be without that goopy creep spread. 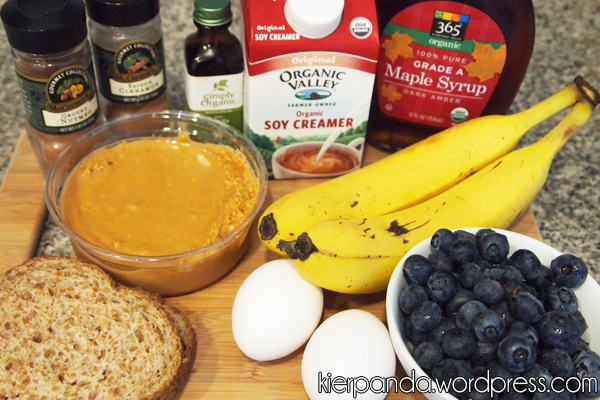 Mmm, Blueberry Creep Spread. The procedure to make this is pretty simple. The entire process, from prep work to plating, should take about 35-45 minutes. This recipe makes 3 French Toast sandwiches. Crack your two eggs into a bowl. Whisk eggs. Add vanilla, nutmeg and cinnamon. Transfer the mixture to a shallow dish. This will be used to dip the sandwiches. 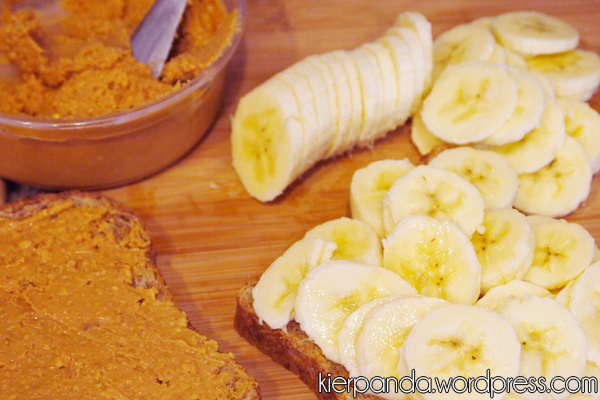 Place bananas on one peanut buttered slice. Place another piece of peanut buttered bread on top to make a sandwich. Place butter in the hot pan. 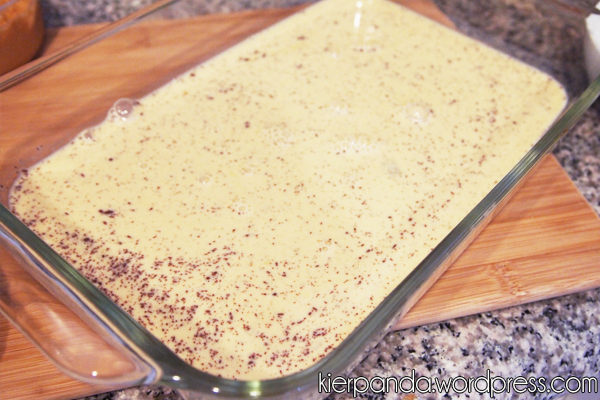 Place your completed sandwich in the egg/cream mixture. Let it soak for a few seconds and then flip the sandwich over to coat the opposite side. When sandwich is fully coated, remove it and place in the hot pan. Let the sandwich cook for about 1 – 2 minutes on each side, or until the side is golden brown. Remove sandwich and place on a plate. (OPTIONAL) Dust with powdered sugar. French Toast would not be complete without a syrup. But this isn’t just French Toast, this is Infestation Pit Toast. If you’re a true Starcraft pro, use your APM and multi-tasking abilities to create the Blueberry Creep Spread while cooking Infestation Pit Toast. Place a small pan on high heat. Let the sauce reduce. The sauce will begin to turn purple when it’s done. Remove from heat and plate sauce with the toast. If you’ve completed your opening, powered through the mid game and survived the late game, then you’re deserved a GG WP. Enjoy your Infestation Pit Toast with Blueberry Creep Spread with a loved one, such as a lovely Queen or loyal Overlord. Oh, and to make that fancy Zerg symbol out of powdered sugar? All you’ll need is a computer, a printer, tape, scissors (or x-acto knife) and an index card (or any thick paper). Start by finding an image of the Zerg symbol and print it out. You may need to re-size it. Once you’ve printed it out, tape the index card behind the symbol. Now start cutting and make that stencil! Just place the stencil over your toast and sprinkle your powdered sugar over it. It should leave you a fancy logo. Hooray! 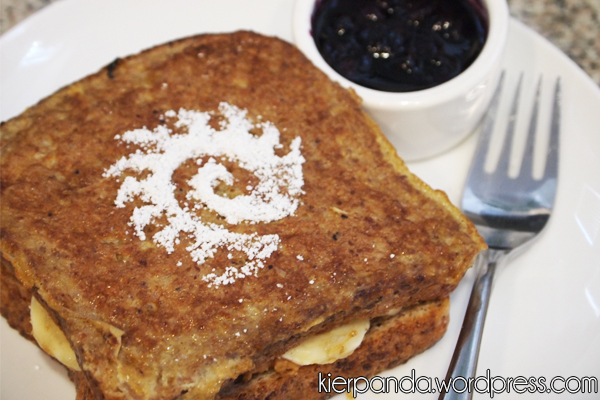 This entry was posted in starcraft and tagged blueberry, breakfast, french toast, toast, zerg by admin. Bookmark the permalink. My wife does most of the cooking, but french toast is my domain. Stealing this, and using it as a discussion piece to indoctrinate my children in the ways of the swarm. Glad you like it! 😀 Wishing your children the best on their future endeavors with the swarm. Sweet, thanks for the recipe! I’m making this for my boyfriend for his birthday tomorrow morning.